Feverfew plant, Chrysanthemum parthenium, has the synonym Tanacetum parthenium. A tea made from the dry leaf or flower of Feverfew is invaluable in the prevention of migraine headaches. This is a bitter tasting herb that has been used medicinally since the time if the Greeks as a remedy for arthritis, indigestion and stress. The leaf is a traditional European method of producing an abortion. A companion plant, the leaves have also been used as an insecticide. Feverfew plant is native to the Northern Hemisphere and is adaptable to most soils and positions. A flood of daisy like flowers appear in summer. Drought and frost resistant. 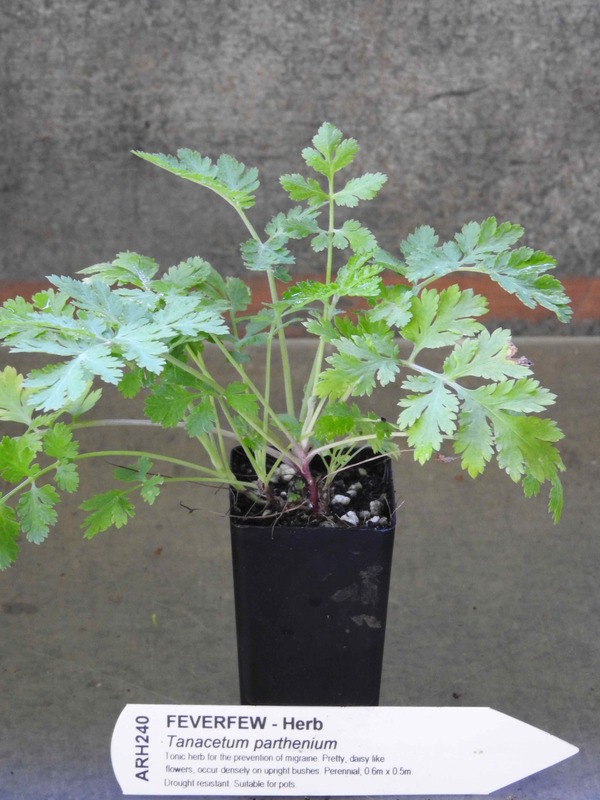 A perennial plant growing to 0.6m x 0.6m. Be the first to review “Feverfew, plant” Click here to cancel reply.